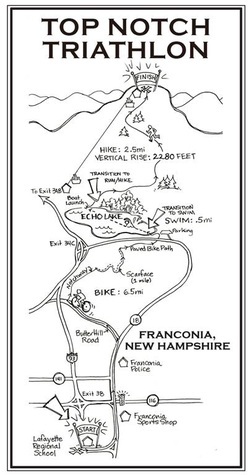 Starting from the picturesque mountain village of Franconia, NH, you will bike along 3 miles of paved road before you embark on a 2 1/2 mile wooded uphill trail climb to the top of Franconia Notch. Along the way, expect to encounter mud, rocks, roots, and more. Then back to pavement on the FNSP Bike Path. The next leg will be a plunge into Echo Lake (average August water temp: 65°) for a brisk swim. Last, but not least, you will start your ascent up the ski trails of Cannon Mountain. Loose gravel and wild life may all be encountered on the 2 1/2 mile trek. Your vertical rise from lake to the summit will be 2280 feet. 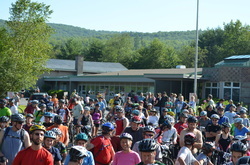 The grand total vertical climb from start to finish will be a phenomenal 3320'! So....don't hesitate; "Take the Challenge!" Follow the arrows and race course volunteers around the perimeter of the Echo Lake parking lot to the maintenance garage area. 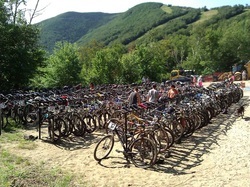 The transition zone consist of multiple bike racks. Please rack your bike and be nice to this hard working crew. Volunteers will be stationed here from 7:30 to 11:00. For team mates, support people and fans take Rt. 93 S, exit 34c, turn right, go past the Echo Lake Parking Lot and turn left on the dirt road to Ernie's House for parking. Located at the boat launch for Echo Lake, Exit 34B. Race volunteers will be at this location from 7:30 to 11:00. At the Transition sign across from the boat launch and at the base of the ski trail is a grassy area to put your footwear and other items for the hike portion of the race. It helps to have a friend hand you these, as it gets very crowded and crazy here. Congratulations! You made it and if you were prepared, at the summit among the cheering crowds is a loved one with some warm clothes for you to donn. The summit of Cannon is 4,080' and typically the temperature is 10-20 degrees cooler than the base. There will be a bottle of water handed to you at the finish line and there are restrooms and a restaurant locate within the summit building. Your race bib is also your ticket for the ride down on the tramcar. This will take you back to the base station of Cannon Mt. From there you will need a ride back down to the New Iron Furnace Brewery in the Village of Franconia for lunch and awards.